To provide an insight into Japanese culture and hospitality through homestay experiences in Ebetsu. 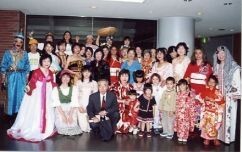 To create opportunities for international contact and friendship at social events. To improve communication through translating, interpreting and language education services. ECIEA was inaugurated on October 31, 1993. The organisation developed out of a desire to increase contact and understanding between residents and non-Japanese visitors to Ebetsu. Underlying our activities is a belief that "In order to build peaceful relations throughout the world, we need to understand each other better". We expect the fruit of our effort will be passed on as a heritage to future generations. To this end we would greatly appreciate your support and co-operation. ECIEA is a democratically organised non-profit organisation which exists through membership fees and donations.